Motor boats and personal watercrafts (PWC) are to avoid accessing Ena, Andalas and Clearwater Creeks, at the south end of Lakelse Lake, to prevent disturbing and displacing waterfowl and wildlife in the park. Signs are posted near the entrances of these creeks. Please see the attached brochure for more details and explanation [PDF]. Lakelse Lake Wetlands Park covers 1,214 hectares at the south end of Lakelse Lake, the largest warm water lake in north western British Columbia. The park contains internationally significant salmon spawning and rearing habitat and regionally important migratory and over-wintering waterfowl and moose winter range. Trumpeter Swans over-winter in the wetlands and Grizzly Bears frequent the area in spring and fall. Personal watercrafts (PWC) and motorized vessels are to avoid accessing Clearwater and Andalas Creeks to prevent disturbing and displacing waterfowl and wildlife in the park. Signs are posted near the entrances of these two creeks. The bog system is very susceptible to disturbance. Organic soils and dwarf shrubs can be severely damaged by vehicles and trampling. Re-growth after damage is slow. Please note: Listed maps are for information only – they may not represent legal boundaries and should not be used for navigation. Lakelse Lake Wetlands Provincial Park is located at the south end of Lakelse Lake approximately 18 km south of Terrace and 40 km north of Kitimat on Highway 37. Access is by boat from Lakelse Lake or hiking via the old logging roads. Use NTS Map Sheet #103 I/7 (Lakelse Lake). 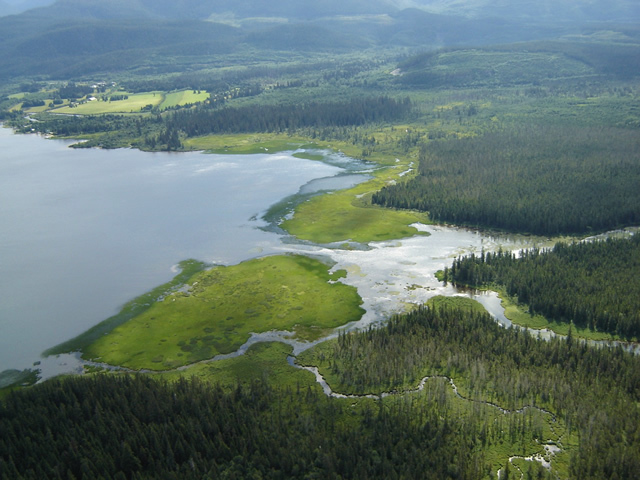 History: Lakelse Lake Wetlands Provincial Park was designated as a park on May 20, 2004, following recommendations from the Kalum Land and Resource Management Plan. Conservation: Lakelse Lake Wetlands Park protects a biologically exceptional and Provincially significant warm-water wetland complex. Warm water springs in the Lakelse Lake Wetlands drain into Lakelse Lake, the largest warm water lake in northwestern BC. Clearwater and Andalas Creeks have open water throughout the winter. The streams are fed by warm water springs along an escarpment above the creeks. The bog ecosystem in the Lakelse Lake Wetlands is regionally significant. It contains scattered and stunted Lodgepole Pine, Western Redcedar, and Western Hemlock. In addition to water loving shrubs and herbs, the bogs contain specialized plants such as sundews, tall white bog orchids and bog club-moss. Accumulations of moss and organic material are often greater than 100cm and water tables are within 20cm of the surface. The south end of Lakelse Lake contains the most extensive cover of emergent and submerged aquatic plants remaining in Lakelse Lake. Dominant plants include Swamp horsetail in water to 1m and reeds in water to 4m in depth. The band of vegetation extends from Schulbuckhand Creek, on the east side of the park, to the outlet of the Lakelse River in the west. The aquatic vegetation has established on shallows built up by sediments from inflowing streams (Schulbuckhand, Clearwater, Andalas, and Ena Creeks). The aquatic vegetation is stabilized by the constant replenishment of sediments and nutrients that are carried in the streams. The park also contains regionally significant valley bottom old growth stands. Valley bottom old growth in the Kitimat Valley is relatively rare and a special feature. Several small stands are located in the northwest corner, between Andalas and Clearwater Creek and on the southeast boundary of the park. Mature and old-growth forests commonly found on higher ground in the Lakelse Lake – Lakelse River area are very productive and contain Western hemlock, Sitka Spruce (largest trees in stand), and Western redcedar. Shrub cover is dense and is dominated by Devil’s Club, Salmonberry, and Oval-leaf huckleberry. Herbs are well developed, but the moss layer is thin. Wildlife: Lakelse Lake Wetlands Park contains internationally significant salmon spawning and rearing habitat and critical habitat for over-wintering steelhead. The large reed beds around the southern shoreline of Lakelse Lake and the streams that run through the alluvial fans and wetlands provide prime fish habitat. Steelhead over-winter in the reed beds. The warm water of Clearwater Creek support a late fall Coho run. Lakelse Lake and its tributaries are important to sockeye salmon. Sockeye salmon rear for a year within the lake prior to migrating to the sea the following April. Typically, 500,000 plus sockeye fry rear in the lake with 5-10,000 sockeye returning to the lake every fall. Although, in recent years as few as 1,000 adult spawners have returned. Consequently, Lakelse sockeye salmon are subject to a recovery strategy. The quality of water that drains through the wetlands is critical to the Lakelse River fishery. The water drains into the lake through the wetlands and out the Lakelse River, which drains from the southwest corner of the lake, approximately 0.5 km from the northern boundary of the park. The wetlands also contain regionally significant waterfowl habitat that is of great importance to migratory and over-wintering waterfowl. Trumpeter Swan (a provincially blue-listed/threatened species) over-winter and nest in the wetlands. There are reports of more than 100 swans wintering in the wetlands. Swans stay in the area from early winter to spring and breeding occurs in the wetlands. Geese and ducks feed and rest in the wetlands and in the reed beds at the south end of the lake. Grizzly and Black Bears use the corridor from Clearwater Lakes along Clearwater Creek to the wetlands. Grizzlies use the east side of the park in the spring (to feed on shrubs) and fall (to feed on salmon). One of the regions highest seasonal (fall) concentrations of Grizzlies is found along Clearwater Creek. Grizzly Bear density varies with the size of the salmon run. Historically there was a large seasonal population of Grizzly Bears in the wetland. Grizzlies were known to stay in the area until December, feeding on the late Coho runs in Coldwater Creek. Occasionally, after the late feeding, Grizzlies denned in the wetlands because snow accumulations prevented them from getting to their usual denning areas. The Cecil Creek drainage, west of the park, is a crossing zone for Grizzlies from four different populations. The Grizzly Bears breed in this area and cubs are often reared in the wetland. The wetlands are also an important seasonal habitat for Black Bear, Wolf, Beaver and other small furbearers. Some of the Black Bears in the area are subspecies Ursus americanus kermodei, (white phase). Black Bear use of the area is very high. The bears forage on Pacific Crab-apple and salmon. Canoeists and Kayakers may enjoy exploring the wetlands. There is a small area for parking vehicles and launching canoes or kayaks near the northeast corner of the park. Directions: Turn off Hwy. #37 about 1.3 km south of Mount Layton Hot Springs. Take the single lane dirt road on the west side of Hwy. #37, beside Schulbuckhand (Scully) Creek. Close the metal gate behind you (near the start of the side road) after you have passed through. Continue down the single lane dirt road for about 1.4 km and turn left into the grassy parking lot and canoe launch area beside Lakelse Lake. Fires and overnight camping are not allowed in this day-use area. It is possible to catch trout, char and Coho salmon in Andalas and Clearwater Creeks. Anyone fishing or angling in British Columbia must have an appropriate licence. Access into the wetlands can be made via the old logging roads leading into the park from the east side of Highway 37, between Schulbuckhand Creek and Onion Lake. These roads are not maintained and can be narrow and overgrown. This park is open to hunting. Please refer to the British Columbia Hunting & Trapping Regulations Synopsis for more information. There are cross-country skiing opportunities in the park. Cross-country skiing is possible on old logging roads on the east side of the park. Developed facilities are located a few kilometres south of the park. There are snowshoeing opportunities in the park. Snowshoeing is possible on old logging roads on the east side of the park. Wilderness, backcountry or walk-in camping is allowed but not encouraged, and no facilities are provided.